Badfish,” the quintessential song by Sublime, with its great melody, lyrics and a memorable guitar solo, is a favorite when performed and is a fitting name for a tribute band. Badfish (the band) covers the popular reggae-meets-ska-punk infused music of Sublime—possibly the most energetic, eclectic band to emerge from any scene anywhere before front man, Bradley Nowell tragically passed away in 1996 while the band was touring. Unfortunately, the Badfish musicians never got to see Sublime play live before Nowell died. Badfish was formed in 2001, while remaining members Joel Hanks and Scott Begin were attending University of Rhode Island. What began as a fun thing to do a few weekend nights during a school semester and the summer has evolved into a full-time touring band, paying tribute to the legacy of Sublime. Badfish quickly began selling out shows including the House of Blues. “We play the music of Sublime for fans who still yearn to get out and see it live,” Begin said. The four members of the dynamic tribute band seemingly have as much fun on stage as their audiences do. Their fans relish the opportunity to see Badfish return to Hilton Head Island and play a live concert in the state-of-the-art, Rooftop Bar at Poseidon Friday, November 6. The venue has quickly become a sought out concert location for local, regional and national musicians as well as for music fans. Begin describes their first experience playing The Rooftop Bar to a packed house. “It was a really fun night. We didn’t know what to expect playing a new place for the first time. A lot of people came out and made it a memorable night,” he said. “We like to perform a high-energy show that feeds off the crowds’ enthusiasm for the music,” Begin said. The size and scale of the venue varies, ranging from big theater light shows to small grungy dive bars with the fans stage-diving inches from the musicians. “We are psyched to perform at all of the venues,” Begin said. Badfish tours all over the United States and occasionally Canada. These days, band members Scott Begin (drums, backing vocals, samples); Patrick Downes (guitar, lead vocals); Joel Hanks (bass guitar, bass synth); and Dorian Duffy (keyboards, samples, guitar, percussion) admit being home with their families is at the top of the list of things they like to do when not performing. They always like playing close to home, but they have a great fan base in Florida. All agree that touring the West Coast is a blast, and sometimes the most unlikely places can end up being great spots for a show. 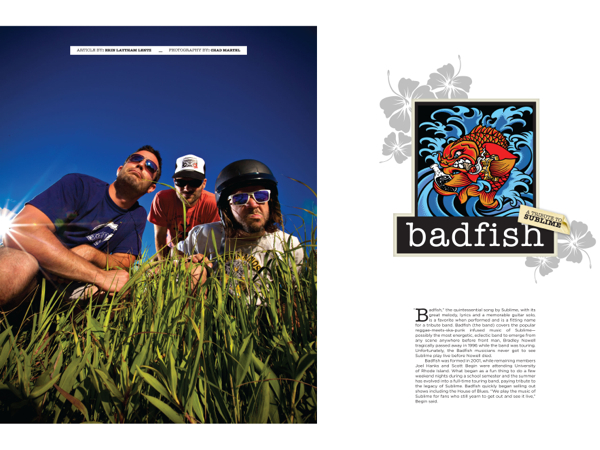 Badfish plays around 200 dates and grosses approximately $1.5 million a year, making their impressions on college towns and music venues while touring. In an article titled, “Tribute Bands are Sometimes Better than the Real Thing,” Rolling Stone referred to Badfish as one of the most successful tribute bands out there. It was exciting for the band to receive this recognition. “Like most music fans, we’ve grown up reading the magazine, so to see ourselves right in there was a trip for sure,” Begin said. A typical Badfish fan spans a wide age range, from high school students to retirees and everyone in between. Sublime’s music affected so many people for such long a time, which is a testament to their legacy. Of note: Original Sublime drummer Bud Gaugh’s band Del Mar has twice been an opening act for Badfish, which means Gaugh has opened for his own tribute band! Rotary: it’s not necessarily what you think!